About Us | DeBiase & Levine Associates, Inc.
DeBiase & Levine Associates, Inc.
DeBiase & Levine Associates, Inc. was established in 1991 as a hospital financial consulting firm based out of Pittsburgh specializing in Medicaid eligibility. 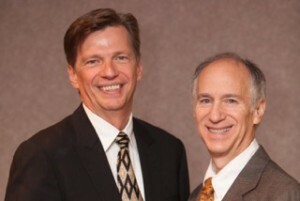 The firm’s two principals, Robert L. DeBiase, Jr. CRCE, and John Levine, JD, MHA, have combined their extensive backgrounds in hospital financial management, hospital administration, hospital legal reimbursement and Medicaid eligibility and Medicaid billing regulations. For the past 25 years, Medicaid eligibility and hospital reimbursement has remained our specialty. Robert L. DeBiase, Jr. CRCE, has 40 years of healthcare financial management experience including over 10 years specific experience as a Director of Patient Financial Services for Charleston Area Medical Center, Magee Women’s Hospital, and the former Central Medical Center. Bob is a past National AAHAM President and Chairman of the Board, and served as Three Rivers Chapter’s second President. He is professionally credentialed as an AAHAM Certified Revenue Cycle Executive, and remains active in promoting professional certification both nationally and locally. Bob is also a member of the ADP’s National Advisory Council. He graduated from West Virginia University with a major in Business. John Levine, JD, MHA, has 40 years of healthcare experience including a one-year hospital administrative residency at Washington County Hospital in Hagerstown, Maryland followed by a hospital administrative position with the former John J. Kane Hospital before attending law school. He earned a Master’s Degree in Healthcare Administration with a major in Hospital Administration from George Washington University and earned his law degree from George Mason University. John has recently completed a 25-year stint serving as Three Rivers AHAAM’s Legal Counsel, and as a long standing member of the Allegheny County Bar serves on arbitration panels hearing civil disputes filed through the Court of Common Pleas. To help round out the DeBiase & Levine team, the Principals have assembled a highly talented team of human services professionals to walk our hospital clienteles’ patients through the demanding process of applying for Medicaid and disability benefits. Our human services staff skillfully and compassionately interact with patients of varying profiles to include disabled, elderly, behavioral health, drug and alcohol, indigent, homeless, transient, etc. who are in need of assistance and advocacy in applying for benefits. DeBiase & Levine recognizes that we are very much in a service industry and, as such, have a Vice President of Operations and Client Services, Elaine Townsend, CRCE, readily available to address our clients’ needs and special requests. With years of hospital client servicing experience throughout Western PA, specifically in the areas of hospital reimbursement and revenue recovery products.